The darker ones in the picture look like drones to me. But if you’re talking about actual workers, well, keep in mind that the queen will mate with many drones during her mating flight(s). This means lots of bee daddies, so the same queen may have different colored children. Nice job on the top bar hives, I’ve got some of my own in Seattle that are doing great! All the dark ones I’m seeing in your photos are definitely drones – big bodies, big eyes. Drones are direct descendants of the queen, as they come from an unfertilized egg. You look like you probably have a Carniolan queen afterall. But as Andres points out, a queen will mate with many drones, a good queen will mate with at least a dozen. So what matters are the drones in the area where she was mated. It’s not uncommon, in open air mating yards, to end up with drones from many races of bees fertilizing the new virgin queens. The only way to guarantee otherwise is through artificial insemination techniques. As to the small cell observation, your eyeball must be calibrated better than mine. I can’t ever tell the difference. I use both natural comb, where the bees draw it themselves in my brood boxes, and foundation for my honey supers. I’m not personally convinced that there is much of a difference. The scientific research certainly says there are no Varroa management benefits to “small cell”. But I think there is something to be said about making the bees build natural comb, so that you know the wax is at least free of bee diseases. No such claims can be made about pesticide contamination in the comb however, unless they’re mostly building the comb from sugar water you’re feeding them, or you happen to live in a pristine area that is free of pesticide usage for a couple of miles surrounding your hive. Looks like they’re doing great though. You have a good queen in that one. They’re good workers and she’s been very prolific. Very exciting results! I can’t add a single thing to what Melisseus and Andres have said (extremely eloquently). I’ll just add my agreement. I’ve heard an unsubstantiated rumour that bees may come in waves of colours in a hive based on which “batch” of sperm the queen is working through. No idea if it’s true, but our bees definitely seem to change colours over time. 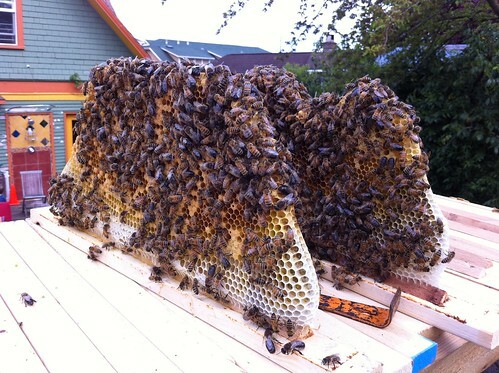 I’m jealous – I’m waiting for my top bar hive to arrive, and no idea where I’m going to get my bees from. I’ve set a bait hive on my conservatory roof, but its probably too late in the season to attract a swarm now, and I don’t even know if there’s any colonies in the vicinity likely to cast off a swarm. Might have to resort to buyng a nuc and go through all the hassles of cnverting them to topbar hive. good job on the top bar!!! lovely comb, i use foundationless and it too has great comb. nothing more i can add about colour, , however i see quite a lot of drones in your photos,,,and a lot of capped drone brood as well. Lovely. I just found your blog. I’ve been intrigued by top bar hives, but have not yet tried one. I’d like to know whether anyone is tracking survival rates for top bar/small cell vs. traditional. I’ll be interested in hearing more about your experience with it. I have Carniolans and your new bees look just like mine. I’ve had some Italian robbers in my bee yard as well – and they are definitely more yellow. Also – I spoke with a veteran beekeeper recently on the Carniolans vs. Italian issue. I prefer C’s because they seem to do better in this climate. He was firmly on the Italian side because of the aggression issue. He said one reason C’s tend overwinter better is that they don’t build up as much brood going into winter. He removes some of the Italian brood in the late fall which he says mimics the Carniolan’s natural pattern. The larger bees are drones. Different color, much bigger, with goggle eyes. They hatch out of cells that are larger and built for drones. 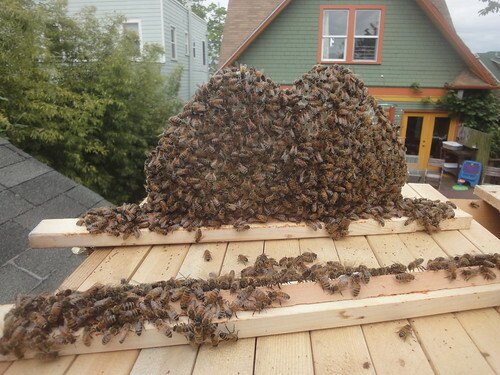 Sometimes large #s of drones are a sign of swarm behavior and a weakening queen, so keep an eye out. 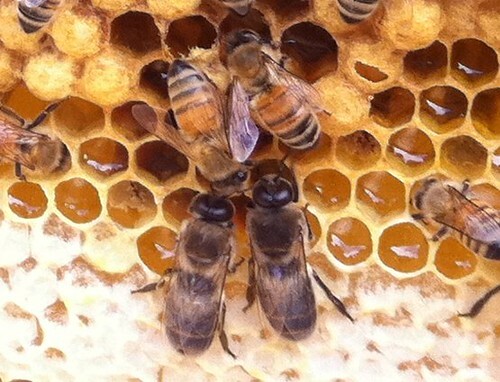 If the queen is played out, she will lay more clone(drone) brood. But some drones are normal. I think the variety that will thrive is one adapted to the local climate / conditions. Local is better.I prefer wild swarms, and put them in simple trad boxes, with empty frames used like top bars. Cheaper and less hassle. Become a Master Beekeeper, help pollinate local crops, and satisfy your sweet tooth! Research into the worldwide decline of honey bees continues to yield potential theories and disturbing findings. Available research seems to point to a synergistic effect of Varroa mites, one or more viruses, the use of chemicals in hives, and pesticide contamination. To help rebuild our resource of local pollinators, Washington State University Snohomish County Extension and Beez Neez Apiary Supply are teaming up to sponsor three sessions of the popular apprentice level course in the Master Beekeeper Program. The five-week course provides a thorough introduction to beekeeping for novice beekeepers as well as a comprehensive refresher course for experienced apiculturists. The first session starts Monday evenings, November 7 through December 5, 2011 from 6:30 p.m. to 9:30 p.m. in McCollum Park at WSU Snohomish County Extension’s Cougar Auditorium, 600 128th ST SE, Everett. The five-week course will be repeated in 2012 starting Monday, January 9, 2012 and again starting Monday, February 27, 2012. Designed to build basic beekeeping skills, topics to be covered include bee biology, equipment, seasonal management requirements, identification, management of pests and diseases, as well as honey removal and processing. The overall focus will hone in on the unique challenges and benefits to beekeeping in the Pacific Northwest. A workshop manual complements the lectures. Participants completing the five-week course and passing the Washington State Apprentice Beekeeper level exam (an open book test) will receive a certificate towards the Journey and Master Beekeeper levels of training. Each session will be taught by local beekeeping professionals, WSU Snohomish County Extension entomologist Dave Pehling, and Jim Tunnell, owner of Beez Neez Apiary in Snohomish. Class size is limited and always fills quickly.There are just a few seats left for the November series. The cost for the five-week course is $70 per person. Register online at http://www.brownpapertickets.com/event/179862. You can also download the form at snohomish.wsu.edu/ag/workshops/Beekeeping11.pdf and mail with your check. For registration information, contact Karie Christensen at (425) 357-6039 or e-mail christensen4@wsu.edu. For more information on the course, contact Dave Pehling, pehling@wsu.edu, (425) 357-6019. Absolutely amazing that such small little creatures can produce something so intricate and beautiful. Also a very interesting insight on how a hive develops depending on the mating tendencies of the queen. All good info! Loving your blog. There is no doubt about the darker bees being drones. Different colored offspring is normal in any bee colony owing to the queen mating with many drones. I doubt that the bees are about to swarm as Erich put it but just good to look. I’m new to all this, so whilst agreeing with everyone about the darker ones being drones due to their shape and size of the eyes, I have not seen this before, my hives and those at our club all have bees of the same colour, with the exception of the queen in some cases. I love the top bar beekeeping method. And it makes it possible cut the honeyfilled comb with a cookie cutter and use it or sell it in honeycomb form which I think is super cool. Thanks so much for sharing this information! I definitely want to try top bar hives one day. I only use Langstroth right now. This is cool. Unfortunatly I have to tell you that’s not the carniolan bee. I’m very sad, because I have found many web sides with wrong description of carniolan bee. They must bee completly grey, without yellow or golden rings. Not even with little tiny mark of yellow. Actualy, in Slovenia, we call them KRANJSKA SIVKA. SIVKA means GREY. Your must be Italian, buckfast or some other bee. It’s posible that queen is carniolan, but drones must be some other spieces. Greetings!